Adopting an environmentally friendly approach in one’s practice isn’t just a “feel good” activity, it can offer direct and indirect business advantages as well. Simply reducing waste and increasing efficiency produce an obvious savings. In addition, making a commitment to sustainability demonstrates a sense of responsibility and community engagement to existing and potential patients, many of whom may seek out and support green businesses. Taking the first steps into sustainability can be intimidating. With that in mind, the ADA Center for Professional Success has compiled a list of suggestions to help members initiate green practices. Following even a few such tips can help produce long-term benefits for both the practice and the environment. Install an amalgam separator, which is not just green, but in many instances now required. Plan office layouts to maximize natural light and ventilation. Place indoor plants around the office. Install a programmable thermostat to reduce HVAC costs. Invest in a central vacuum system that uses no water and has an amalgam trap. Use sensor-operated faucets and low-flow faucets and fixtures. Use only chlorine-free, high post-consumer recycled paper products instead of traditional paper products. Drink tap water as an alternative to bottled water. Encourage recycling with clearly labeled and accessible recycling containers.Conduct a practice energy audit. For the complete list, please visit the ADA website. You can find many additional resources for going green on the web. For example, many states offer rebates and tax incentives to businesses that meet certain green standards. Look at DSIRE (Database of State Incentives for Renewables & Efficiency), an initiative of the North Carolina Clean Energy Technology Center, which offers a state by state list of incentives and policies that support renewables and energy efficiency in the United States. The U.S. Department of Energy has posted a series of tips for home energy audits, many of which are applicable to small businesses. In addition, the federal USA.gov website includes additional resources for energy efficiency and environmental sustainability. A green dental practice might also encourage positive habits among patients and staff members. Suggest to patients that they turn off the faucet when they brush their teeth and post reminders in restrooms and break areas to help conserve water. 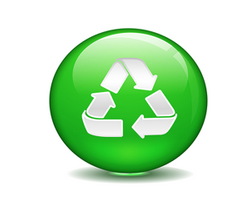 There may be a good business case to implement a green approach in your practice. A few easy-to-implement steps can take you down a rewarding path to success and sustainability. This blog post, republished with permission, originally appeared in the summer 2018 issue of the ADA’s Dental Practice Success.